Riders take part in 2017 Florida Honor Ride. The seventh annual event supporting veterans and first responders takes place Saturday in St. Petersburg. The event raises funds for Project Hero, a nonprofit organization that helps rehabilitate veterans and first responders impacted by post-traumatic stress disorder or other traumatic injuries. It also gives them a place where they can make connections with people they have something in common with. “The issue of helping our veterans and first responders who are suffering from PTSD, but also traumatic brain injury and military sexual trauma as well, is what Project Hero is dedicated to helping,” said Peter Bylsma, director of marketing communications for Project Hero. Bylsma explained that thousands of veterans and first responders are affected by PTSD or traumatic brain injury. There are various therapy methods that have been established nationwide to help them. According to Bylsma, bike riding happens to be a unique experience that brings communities together and provides goals to accomplish. “We’re not here to race, we’re here to heal. When we get on the bike we ride in two lines. There is a community building, a therapeutic experience that’s simply unmatched by any other type of therapy. Cycling is mental, spiritual, as well as physical,” said Bylsma. “Whoever knows someone who’s in a dark place-- a veteran, a first responder, someone who is going down that road. We’re the people you can turn to for support and to help that person,” said Bylsma. There are different riding paths with varying distances of 20, 38 or 60 miles. Each route is designed for different skill levels. 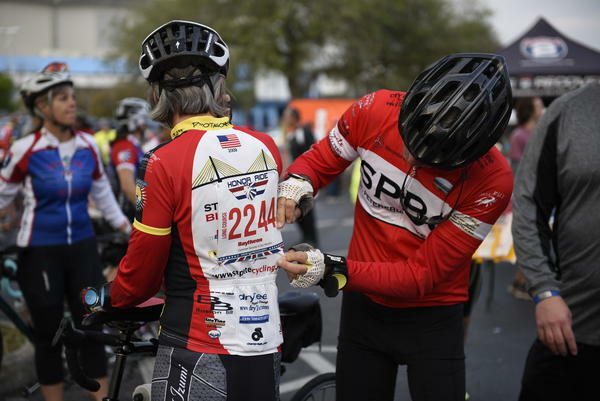 Wounded veterans can ride for free. This event starts and finishes at Tropicana Field in downtown St. Petersburg on Saturday, beginning at 8 a.m. Registration can be found on the Project Hero website.